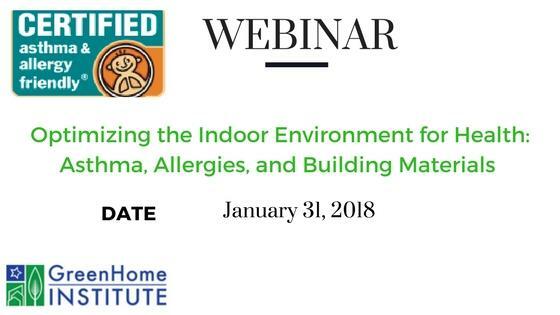 Our Webinar “Optimizing the Indoor Environment for Health Asthma, Allergies, and Building Materials” is now available in replay! Dr. John McKeon, CEO of Allergy Standards, and Courtney Sunna, MBA, gave an insightful one hour webinar course about why it is important to choose safer products and materials, and how to use Certified Products as a marketing platform to raise awareness and demand. They talk about the demand for transparency and healthier materials, with information about how building products can be tested, certified, and incorporated into projects. They also discuss the rigorousness of standard development and testing protocols and how Certified asthma & allergy friendly® products contribute to healthier environments. Click on the video below to watch the webinar in replay. Who are Dr. John McKeon and Courtney Sunna? Courtney Sunna is the VP of Sales for U.S. asthma and allergy friendly® Certification. In this role, she focuses on brand partnerships and strategic growth with the heads of major corporations including Procter & Gamble, 3M, Tarkett, Owens Corning, Ingersoll Rand, and Benjamin Moore, as well as managing executive relations with retail stores such as Bed Bath & Beyond, Macys, Home Depot, and Best Buy. Dr John McKeon is the CEO and co-founder of the international standards body Allergy Standards Ltd. He is a medical doctor, a Fellow of the Royal College of Surgeons in Ireland, and holds a number of business development qualifications. He is the Entrepreneur in Residence at Trinity College Dublin. His company, Allergy Standards Ltd., develops the scientific standards behind the asthma & allergy friendly® Certification Program, which allows consumers to identify products which have been proven through rigorous testing to be more suitable for asthma and allergy sufferers. Dr McKeon is a regular contributor at conferences, in print and other media articles, and at seminars, on the subjects of asthma, allergy, and consumer products. He maintains a keen interest in clinical medicine and has been published in medical journals.